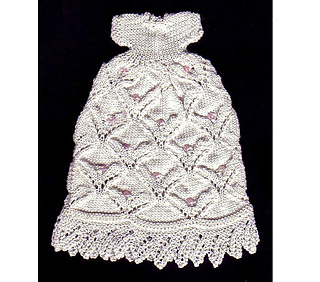 This gown will fit a 3.25 inch porcelain dollshouse baby doll. The gown has been designed with a back opening so that it can be removed from the doll. The front and back are made separately then sewn together at the shoulder with the sleeve, neck and back opening edges added afterwards. The lacy lower edging is made separately as a strip and then sewn around the lower edge of the gown. There are many ways to add the 11/0 seed beads to miniature knitting but I have found most of them don’t keep the tiny bead sitting on the front of the piece. An explanation of my method is included in the pattern.